I get my first view of Kanchenjunga at around 6 a.m. We'd left Darjeeling at some ungodly hour and the swaying suspension of the old Ambassador as it wound around the hillside curves had lulled me off to sleep. But now the sun is nearly up and the mist is fizzing away and coming round a majestic corner planted with a mesmerically even grove of poker straight pines I see the third highest mountain in the world right there before me, closer than I'd imagined, white against the thin pink light of dawn. We stop the car to take some photographs and nod to a woman piling fresh cut cardomom into a basket that she'll counterbalance on her back with a strap stretched round her forehead. We're still technically in West Bengal, Darjeeling two hours behind us, the state of Sikkim still two hours ahead. But it feels different already, like we've already crossed the border and have passed out of what can still culturally be regarded as India and into the strange pocket of a region that is my destination. An independent kingdom until it was annexed by India in 1975, the rhombus that is Sikkim is formed by Nebal to the east, Tibet to the North and West, and Bhutan and West Bengal to the South. Though the area was supposedly originally home to the Lepcha tribe who migrated here in the 13th century from Assam and who now have a 'homeland' in the restricted Dzongu region in the centre of the state, seventy-five percent of the population is of now Nepali extraction. Thanks to the political unrest that preceded the annexation in 1975 and the fact that the Chinese refuse to accept Sikkim as part of India (claiming it is part of Tibet and like the rest of Tibet therefore actually Chinese) and keep large a troop presence stationed on their side of the border, travelling in Sikkim is heavily restricted. It's only in the last few years that permits have become readily available: you can now visit Sikkim for 15 days, with a 15 day extension available from the Home Office in the capital, Gangtok. The standard visa allows you to visit the main centres of Gangtok and Phodong and the stunning temples at Pemayangtse and Rumtek, and a special endorsement is required (but not hard to get) to visit the more remote areas around the latter, such as the sacred lake of Khecheopari. It's not all the time in the world but it's enough time to get a good taste of the place and do at least one serious trek - and if you come here you have to trek, even if you only do a couple of day hikes. This may be the land of the gods, but they won't speak to you unless you come bearing blisters. Around breakfast time we cross into Sikkim proper, via the great slab of a bridge that vaults the river at the little town of Meli Bazaar, and after sharing a cup of chai with the surprisingly relaxed police captain in charge of the checkpoint we begin our winding ascent up the first of the many hills we are to conquer that day. And conquer is the word; these aren't any old hills: these are the foothills of the Himalaya, and they're high enough to provide local farmers with two climates: tropical down on the valley floors, and alpine up on the ridges and peaks. On the lower slopes (everything - with the exception of tea, which is grown at vertiginous angles, and cardomom, which likes the cool gloom of the forest floor - is farmed on terraces, thousands of them, Aztec-style) you find rice paddies, groves of bamboo, banana trees, fan ferns and great cheese plants dwarfing houses built in a strangely familiar Elizabethan style - half-timbered, thatched (although like as not rooved with corrugated iron these days) and panelled with wattle and daub. The main difference is the carpentry: the standard's a lot higher quality than that of your standard Shakespearean relic (although somewhere, you suspect, there are buzzsaws) and bamboo wattles beautifully, much more neatly than willow or hazel. Higher up the hills great forests of pine and teak shelter the aforementioned cardomom groves (although in fact it's the other way around - the government has promoted cardomom farming here because it allows people to make a good living from the forest that depends on not cutting down the trees; the region now produces 80% of India's cardomom crop) and the promontaries and peaks are dotted with gompas and stupas (that's buddhist temples and shrines to you, guv'ner). And everywhere, drawn up in ranks on the temple approaches or standing on the outskirts of villages by the side of the road there are lines of bamboo poles sporting slender prayer flags, two feet wide by perhaps eighteen high and coloured either red or blue or white or yellow or green, standing in monochrome groups and flickering in the breeze like tall pillars of flame. The roads are vertiginous, crumbling at the edges into dizzying drops and signposted with homilies and warnings ('Success is getting what you want, happiness is liking what you get'; 'Speed makes haste into the next life'). Apart from the main routes into and out of the state, they're rarely metalled but are built by hand: hiking or driving you get used to passing small crowds of people - often containing entire family groups from young children to grandmothers - breaking ochre rocks by the roadsides and laying them Roman-style. It's a back-breaking, unrelenting task, and one that's never done. 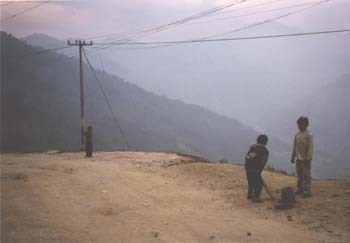 The lorries that pound these chippings with increasing frequency now that the central Indian government is subsidising industry, agriculture and tourism in the region in order to closer bind Sikkim to its new motherland destroy them in just two short years, after which they have to be laid all over again. Being an honoured guest of the tourist board I'm whisked on past these scenes by my chauffeur, onwards and upwards to the Hotel Mount Pandim - the local official tourist lodge - where I'm to spend my first night. Perched on top of a lonely peak outside the village of Pelling and aptly described by Lonely Planet as having a 'vaguely Soviet-era atmosphere,' this is a classic example of governmental concrete architecture. Rundown, cold, drafty and expensive, its cavernous rooms nicely chilled by the lack of heating and vast rusting windows, I didn't see the point of the place at all until bright sunlight woke me at five a.m. to the most specutacular view I have ever seen: the building provides the best vantage point on Kanchenjunga you can get without going on a hike, and you don't even have to get out of bed to enjoy it. The mountain, chipped out from an ice blue sky, just a wisp of cloud across its tip to show it had dimension, completely filled that same window I'd been cursing throughout the night. A short walk up the hill from the tourist lodge is the most important monastery in Sikkim. This is Pemangyantse (which means Perfect Sublime Lotus), and apart from being a beautiful building in an incredible position, the monastery houses a twenty foot model of the seven tiers of the Buddhist pantheon carved from one piece of wood (and as it's forbidden to take photographs of the thing you'll just have to come here to see it). It is, I think, one of the minor wonders of the world, although perhaps not as wonderous as the six hour, 27 km hike I did the following day, down from the foothill that cups Lake Kheocheopalri and back up the next one to where Pemanyangtse is perched. The Lake itself is a sacred ellipse of water ringed with prayer flags and set into an green inverted cone of foliage and hill; there's an old sadhu here who mans the shrine and if you're nice to him he'll bless your journey. And a wonderful journey it is, down along the aforementioned stone roads through tiny hamlets and villages, through rice paddies and cardomon groves, past girls herding goats and boys playing cricket on the edge of sheer drops until you cross the river tumbling through the deep valley floor and climb again through more of the same, the great peak of Kanchenjunga passing in and out of view ahead of you like a beacon as you pant your way around the intersected ridges of the hogsbacks. I ended my trek on the tiny terrace of the Alpine Restaurant in the bustling village of Pelling, the nearest village to Pemanyangtse and one which is fast expanding to cater for the new tourist trade. Sinking a well earned Hit beer I talked philosophy with a Danish buddhist called Maurice who'd come to Sikkim in order to give up eating. He was dressed in a long wool mountain smock of the kind favoured in the Indian hilltowns on the other side of the Himalaya and sported a thin beard and ginger hair and he had the kind of hard angular skull that's crying out for trephanation. 'Where you from?' I asked, seeing that he was keen for a chat. 'Oh, many places,' he said. I yawned, looked away the unbelievable sunset. 'Nice,' I said. 'We are all just light,' he remarked. 'This,' he waved his arm to encompass the scene, 'this is all just illusion.' Then why was he bothering to sit and watch it with me? I wondered. When I told him I was hungry he reminded about the not eating thing and assured me that it was the final hurdle he needed to clear before achieving Nirvana. But it was a goal that was still some way off if the eagerness with which he accepted my offer to treat him to dinner was anything to go by. I can't say I was convinced: as I drained my beer and watched the sunset, Kanchenjunga purpling until it vanished completely into the iron of the sky, it seemed to me that Nirvana couldn't be much better than this.